WASHINGTON (March 26, 2008) -- Six Soldiers were honored today for their contributions to the health of the Army's all-volunteer fighting force. Secretary of the Army Pete Geren hosted the 2007 Secretary of the Army Career Counselor and Recruiter of the Year Awards at the Pentagon. Secretary of the Army Pete Geren shakes hands with Sgt. 1st Class Brad A. 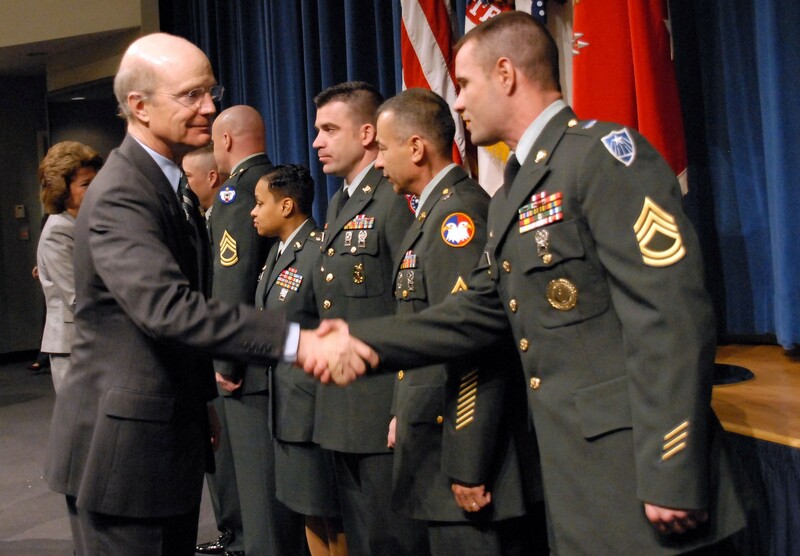 Bond following the 2007 Secretary of the Army Career Counselor and Recruiter of the Year Awards March 26 at the Pentagon. Bond was named the 2007 Army National Guard Recruiting and Retention NCO of the Year. "We are a nation long at war, in our seventh year at war in Afghanistan, and this month in our fifth year in Iraq. That is the third-longest war in our nation's history and the longest war we have ever fought with an all-volunteer force," Geren said. "We now have a recruiting environment that has to be as tough as we've ever faced." Geren said the Army has found the propensity to enlist among young people has gone down, and the inclination for "influencers" such as parents, teachers and mentors to support a young person's decision to enlist or re-enlist has also gone down. Despite the recruiting environment, the Army needs recruiters and career counselors to meet their goals so the Army can continue to do its job, Geren said. "As an all-volunteer force, the health of the force, and in fact the very existence of the force depends on our recruiters and our career counselors," he said. "And today we recognize those recruiters and career counselors that are the best of the best."